Leading Exporter of beaded tassel tie, decorative tassel tie and fancy tassel tie from Faridabad. Beaded Tassel Tie is offered by us to customers in bulk. The offered Beaded Tassel Tie is available in different colors. Customers appreciated it due to its smooth texture and elegant look. 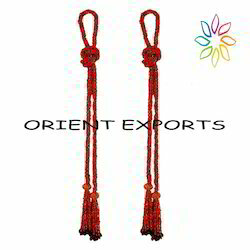 Further, we ensure to deliver these Beaded Tassel Ties to various places across the country in given time frame. We are passionately engaged in providing an exclusive array of Decorative Tassel Tie that is mainly used crafting home furnishing products. This tie is designed and crafted by our deft professionals from the best grade raw material at par with the market prevalent norms. In addition to this, every single piece offered by us is subject to diverse tests to ensure that it complies with the set industry quality standards. Owing to the years of industrial experience, we have been able to serve our valued clients with a wide range of Fancy Tassel Tie. Widely demanded in textile industry, this tie is designed by our adroit professionals using quality tested raw material and latest machines. Further, we test our products on varied parameters before their final dispatch in order to make sure that this tie in conformity with the global quality norms.